The key themes for the Root Chakra is support, safety and security… if you feel that any of these are missing or lacking from your life, then there’s a good chance that this Chakra will need some attention. When this energy centre is balanced we can feel very positive and hopeful about life. We find it easy to trust that everything is working out and that we have nothing to fear. We are able to give unconditionally and express kindness, compassion and love to those around us. BUT, when things are not going so well, it’s easy for us to turn into a victim of life. I’m sure you know the kind of person I mean…. they blame everything and everyone else for how they feel and they believe that life is happening to them and not for them! These are the kind of people I do my very best to avoid…..
You will have a lack of focus, determination and discipline… hello overwhelm and procrastination! A balanced Root Chakra is all about having health and vitality and feeling safe, secure and supported in this world. Each of us has a right to joy and happiness and we should strive towards laughter, fun and being playful every day. Grounding is an essential part of all this and so is your ability to trust – not just trusting others but in the bigger plan of your life. So often we feel the need to control everything ourselves because we believe that if we don’t we may not survive or get what we want or need. It’s time…. Trust in your body. Trust in yourself. Trust in the Universe/God/Divine/Source. Believe me, it will bring you much peace and it will allow you to be more present and enjoy everyday. As part of my new program AWAKEN, we explore the chakras to help us understand what is going on within our bodies. If you would like to know more about being sensitive/a empath, how to manage and understand energy, plus you want to connect in with your inner wisdom, then check out AWAKEN. 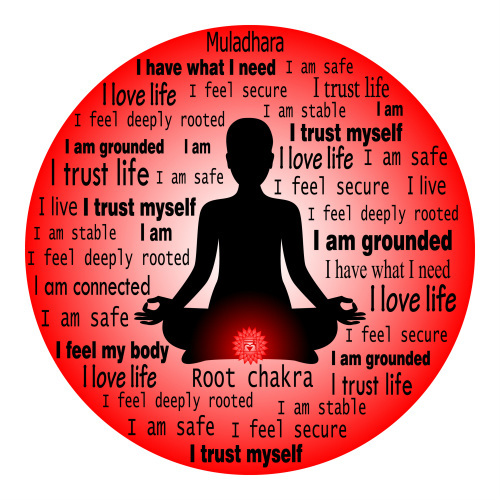 2 Comments on "The Root Chakra"
Great post! I definitely need some work here. You are so amazing! So blessed to have you as my friend and healer! So glad it was helpful! Very grateful to be able to support you and to call you a friend - lucky me!